Those who won our independence as a nation didnâ€™t just fling imported tea into Boston harbor â€” they did whatever was necessary to wrest themselves from British control. We need not call out the Minutemen, but to avoid the consequences of dependence we must become independent â€” not just of imported oil, but of oil itself. Does this mean that we cannot use oil or import any? Of course not. Oil is a useful commodity that can readily transport energy long distances. It already has competition from natural gas in industry and from gas and electricity for heating. But in transportation it brooks no competition â€” it is thus not just a commodity but a strategic commodity. Oilâ€™s monopoly on transportation gives intolerable power to OPEC and the nations that dominate oil ownership and production. This monopoly must be broken. To tell us that in following this path we are doing a â€œdisservice to the nationâ€ and should resign ourselves to oil dependence is like telling us we should not urge an alcoholic to stop drinking, but should rather impress upon him the health advantages of red wine. Not long ago, technology broke the power of another strategic commodity. Until around the end of the nineteenth century salt had such a position because it was the only means of preserving meat. Odd as it seems today, salt mines conferred national power and wars were even fought over control of them. Today, no nation sways history because it has salt mines. Salt is still a useful commodity for a range of purposes. We import some salt, so if one defines independence as autarky we are not â€œsalt independentâ€. But to most of us there is no â€œsalt dependenceâ€ problem at all â€” because electricity and refrigeration decisively ended saltâ€™s monopoly of meat preservation, and thus its strategic importance. We can and must do the same thing to oil. By moving toward utilizing the batteries that have been developed for modern electronics we can rather soon have â€œplug-in hybridsâ€ that travel 20-40 miles on an inexpensive charge of night-time off-peak electricity at a small fraction of gasolineâ€™s cost. (After driving that distance plug-ins keep going as ordinary hybrids.) Dozens of ordinary hybrids converted to plug-ins now on the road are getting in the range of 100 mpg of gasoline. And millions of flexible-fuel vehicles are also now in the fleet. Producing them adds costs well under $100 and they can use up to 85-percent ethanol (before long to be made from biomass rather than corn) â€” methanol, butanol, and other alternative fuels produced from grasses and even waste. Six explosions in Mexico early this morning shut down major oil, natural gas, and propane pipelines and forced the evacuations of surrounding residents. AP reports that police say a "small, shadowy leftist group linked to similar attacks in July left a note claiming responsibility". Sunday night there was an explosion on a pipeline carrying natural gas from Iran to Turkey, halting the flow of gas. Russia's state controlled natural gas monopoly Gazprom increased its exports to Turkey in response. Pipeline attacks are quite common and extremely difficult to prevent. For more details on this threat to energy security and efforts to address it read: Pipeline sabotage is terroristâ€™s weapon of choice. To understand the appeal of pipelines as a terrorist target read: Terror's next target. For a long time Set America Free has emphasized the benefits of full fuel flexibility which includes ALL alternative fuels, not only ethanol. We have nothing against ethanol but we oppose the myopic, ethanol-only approach that currently dominates our energy debate. Volvo has recently validated our approach, producing seven truly flexible diesel trucks modified to run solely on biodiesel, ethanol, methanol, DME, synthetic diesel, and hydrogen gas combined with biogas. Volvo conducted a comprehensive assessment of which fuels faired the best. There were seven categories: impact on climate, energy efficiency, land use efficiency, fuel potential, fuel costs, vehicle adaptation, and fuel infrastructure. The results may surprise many: First Volvo showed that ethanol and methanol work equally well in the same system which means that there is no reason why flex fuel cars sold in the U.S. not be able to run on methanol in addition to ethanol. Second, the comperative study showed that DME and methanol ranked among the highest in all but the last two, while ethanol ranked low to lowest in all categories. The promising results for methanol and DME were based on the assumption that the fuels would be produced via the black liquor gasification process, which has been developed in Sweden. Black liquor is a sludge byproduct of paper pulping. According to the methanol Institute if every paper mill in the U.S. used this process we could produce 9.3 billion gallons of methanol per year--almost double the amount of corn ethanol currently produced in the U.S.
is on page 2 of this IEEE article: Lithium Batteries Take to the Road. 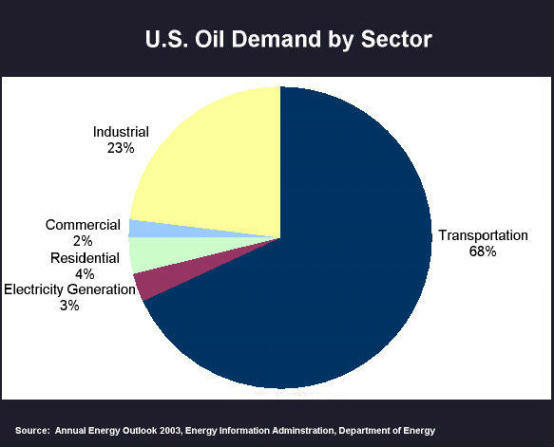 Oil demand: Why is the transportation sector key? The United States consumes 20.1 million barrels of oil per day, 69 percent of which is used for transportation. Nearly 85 percent of the energy consumed in the transportation sector is for highway vehicle travel, followed by air (9 percent) and rail and water (6 percent combined). Energy consumption in the transportation sector consists almost exclusively (98 percent) of petroleum fuels. What are the economic implications of oil dependence? Oil dependence has considerable economic implications. Shrinking petroleum supply and rising demand translate into higher costs. Both American consumers and the U.S. economy are already suffering from the cumulative effect of recent increases in gas prices. Fully one-quarter of the U.S. trade deficit is associated with oil imports. By some estimates, we lose 27,000 jobs for every billion dollars of additional oil imports. Serious domestic and global economic dislocation would almost certainly occur should disruption of supply take place. For a discussion of the hidden cost of oil click here. Why is oil dependence a national security problem? The U.S. accounts for a quarter of the world's oil demand, yet it is has a mere three percent of global oil reserves. Consequently, the U.S. is heavily - and increasingly - dependent on foreign oil. Nearly 40 percent of all U.S. oil imports come from potentially hostile or unstable regimes. And 90 percent of conventional oil reserves are in these nations including ones that are sponsors of or allied with radical Islamists who foment hatred against the US. Buying billions of dollars worth of oil provides such nations the means to continue and gather strength in their war against the free world. Further, oil supply is vulnerable to terror attacks by jihadists who wish to break our economic backbone. The Set America Free Coalition is co-sponsoring a one-day Symposium, "Plug-In Hybrids: Accelerating Progress," on 19 September 2007, at the Omni Shoreham Hotel, Washington D.C. The symposium will cover: plug-in hybrids on the road today; fuel economy; efficiency and economics of plug-in hybrids; technology challenges; the electric grid and plug-in hybrids; legislative needs; and more. For more information and to register, click here. You are currently browsing the Set America Free Notes&Comments blog archives for September, 2007.